THE HUGE INTERNATIONAL BESTSELLERA former FBI hostage negotiator offers a new, field-tested approach to negotiating - effective in any situation. `Riveting' Adam Grant`Stupendous' The Week`Brilliant' Guardian____________________________After a stint policing the rough streets of Kansas City, Missouri, Chris Voss joined the FBI, where his career as a kidnapping negotiator brought him face-to-face with bank robbers, gang leaders and terrorists. 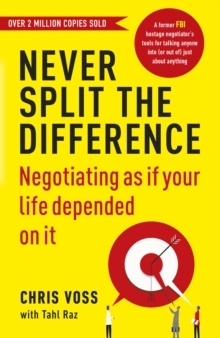 Never Split the Difference takes you inside his world of high-stakes negotiations, revealing the nine key principles that helped Voss and his colleagues succeed when it mattered the most - when people's lives were at stake.